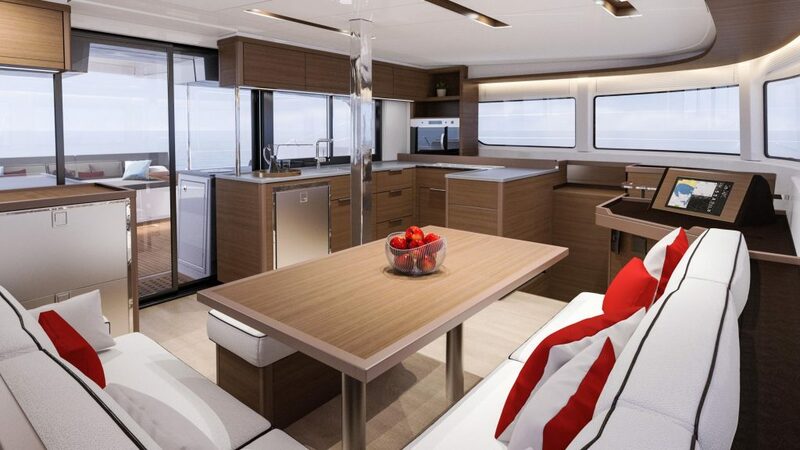 A faster and more luxurious successor to the ultra successful 450. 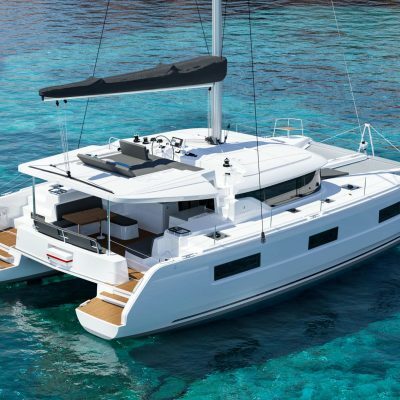 The new look hard-chine running the length of the hulls creates powerful lines and delivers better performance through the water due to less wetted surface area. 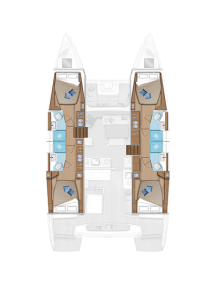 Multiple areas to relax, an exceptional galley,and a sumptuous level of comfort and choice below decks. Practical and glamorous she appeals to families on holiday and blue-water sailors alike. 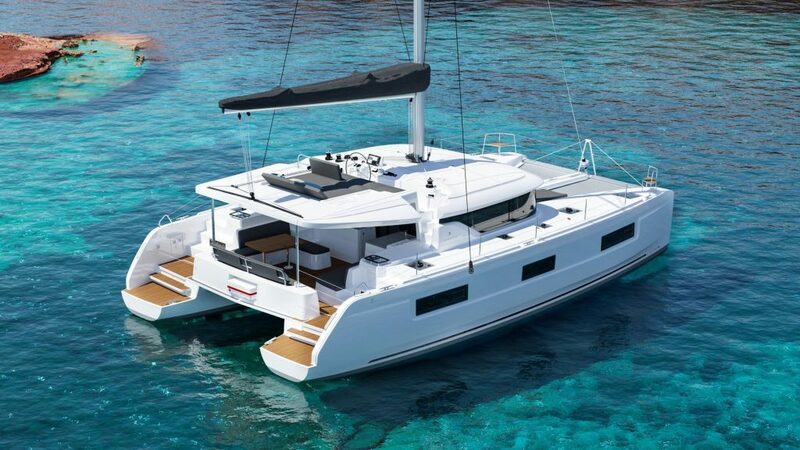 Or please scroll down to read more about this evolutionary catamaran. 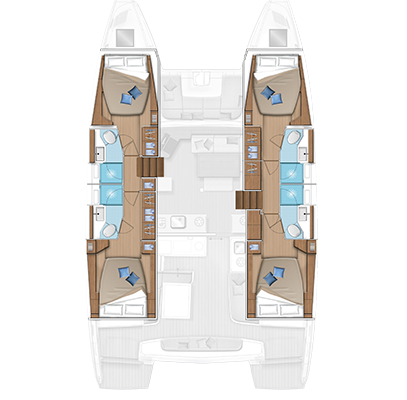 There are multiple areas to relax with prime position being huge sun-loungers on the fly-bridge behind the helm-station. The fly-bridge itself is sociable and easily seats six. 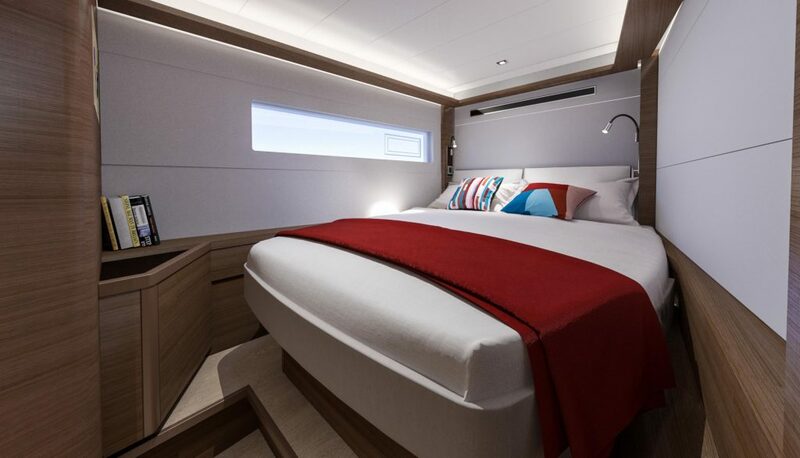 The neatly designed forward cockpit area has comfortable cushions flush with the deck and an open walkway onto the trampoline. The aft cockpit is spacious and well thought out. 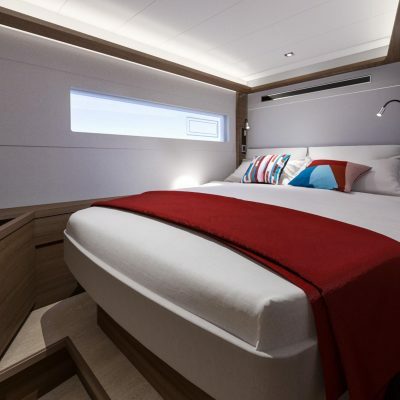 When the cockpit table is not in use it folds down and there is an ingenious sliding seat that folds beneath the table, allowing access from the cockpit to the fly-bridge on the port side. 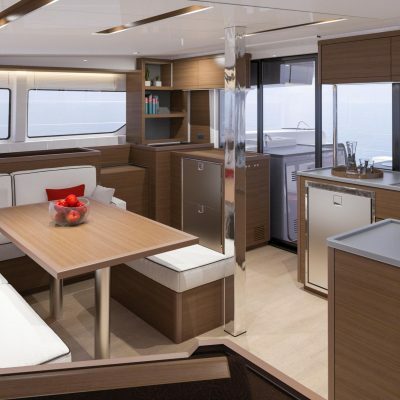 Also in the cockpit, there is a sink, front loading fridge and plenty of storage on the starboard side and forward to port an extensive countertop with built in ice box. The salon itself is spacious and sumptuous. 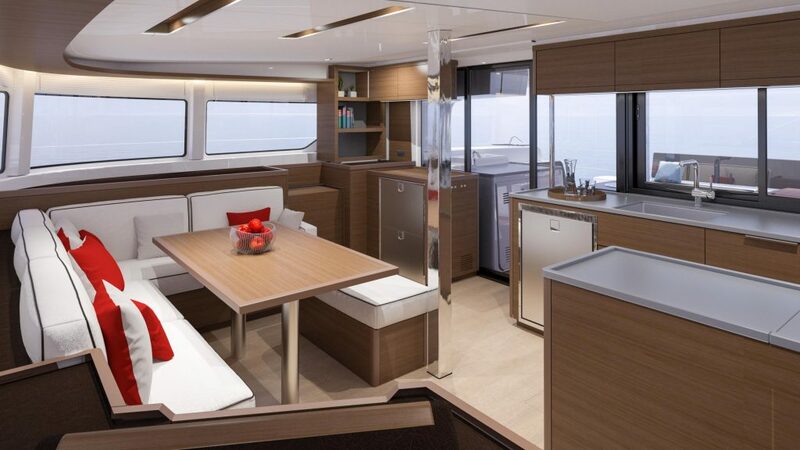 The galley is exceptional with copious counter space and storage, with a big sliding window that opens to the cockpit. 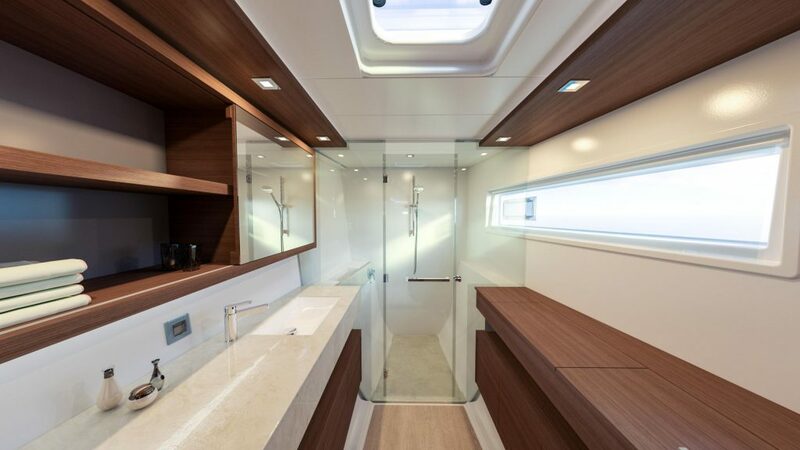 Natural light streams through the wrap around vertical windows, and there’s a retractable sash window forward for maximum ventilation as well as passing drinks to the forward cockpit. 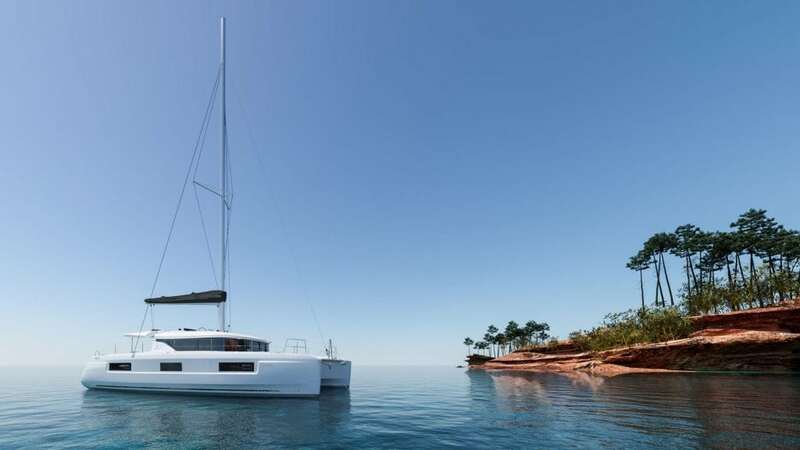 Fully air-conditioned, with generator, extensive fridge and freezer space and the water-maker option makes this a design for easy living. 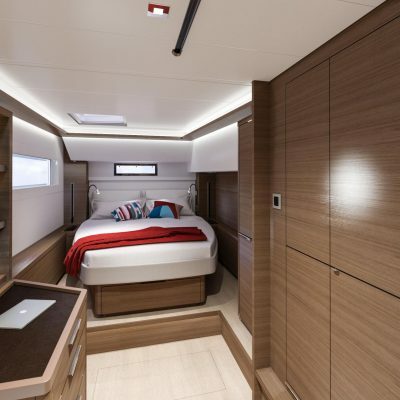 Interior and accommodation is by Nauta Design. 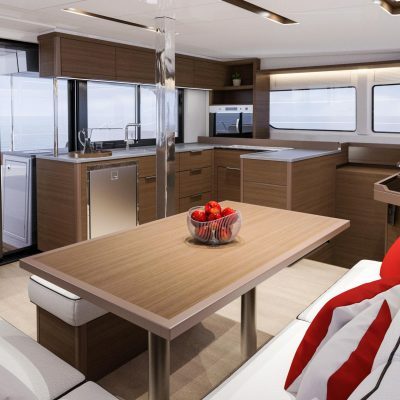 The combination of elegance and functionality, and the superior level of comfort are extraordinary. 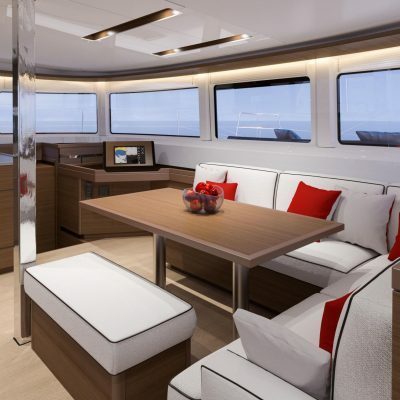 Sinking into the saloon settees, you have to remind yourself you are on a yacht. 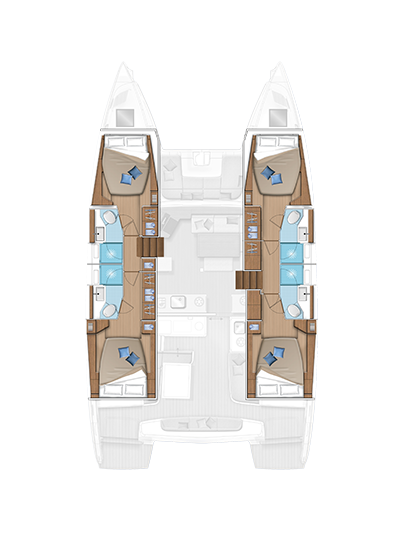 In the hulls you can choose a 3-cabin owner version or a 4-cabin all en-suite option. 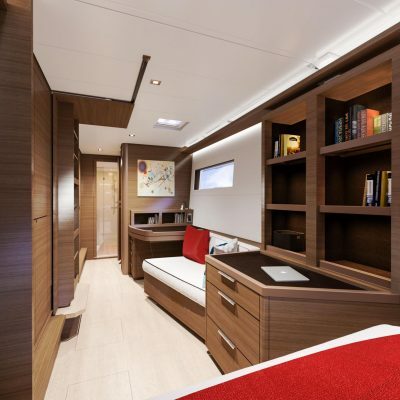 Berths are large doubles in all cabins, except in the owners suite on the 3-cabin where it’s a beautiful island berth. 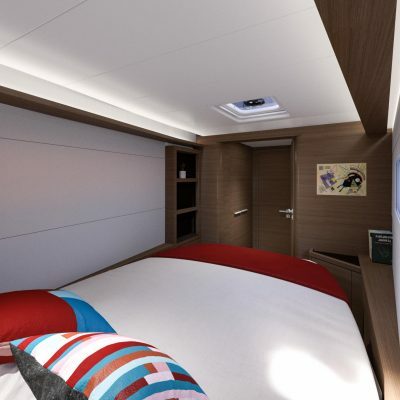 Bountiful storage in hanging lockers and cupboards leaves cabins clear of clutter. 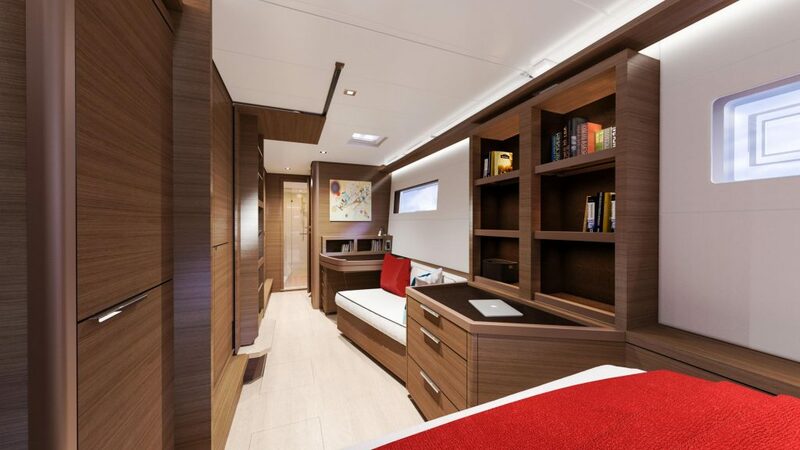 You also have a choice of interior joinery finishes and soft furnishing options allowing personalized customization. 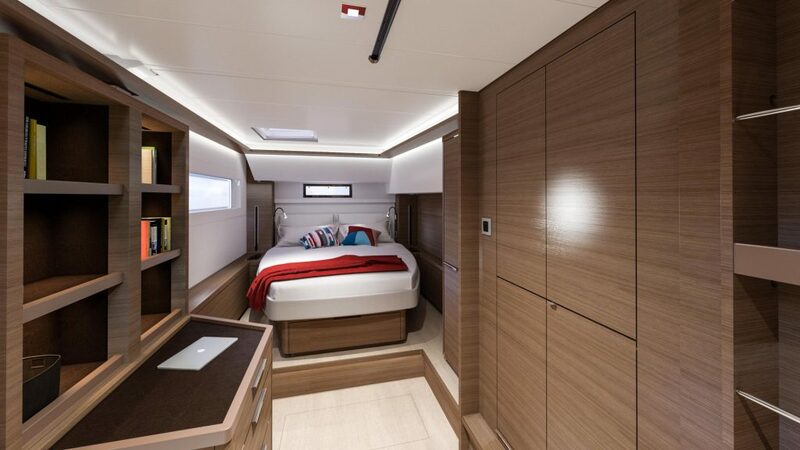 Large fixed hull windows with opening port-lights bring natural light in abundance and great ventilation. 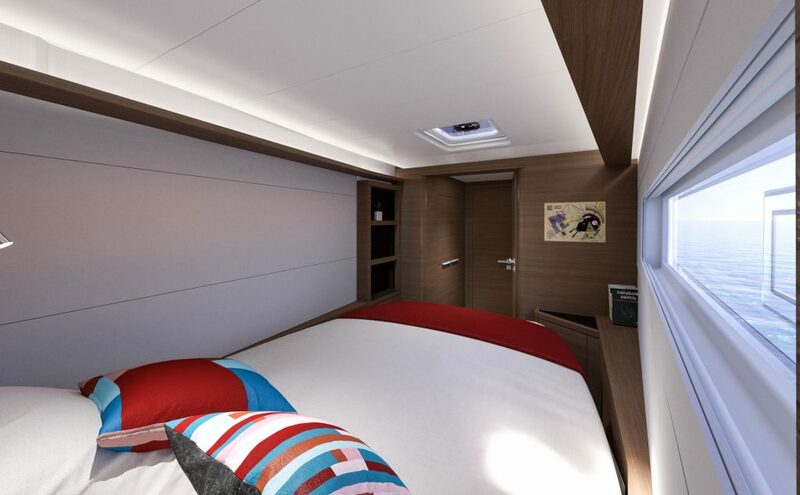 The cabins give you a feeling of space and complete well being. 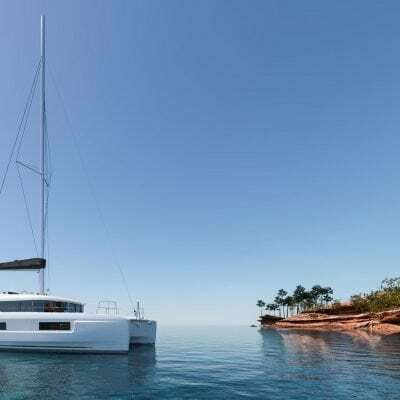 The mast step positioned further aft reduces pitching and allows a larger self tacking jib, which is set on a curved track for added smoothness through the tack or gybe. 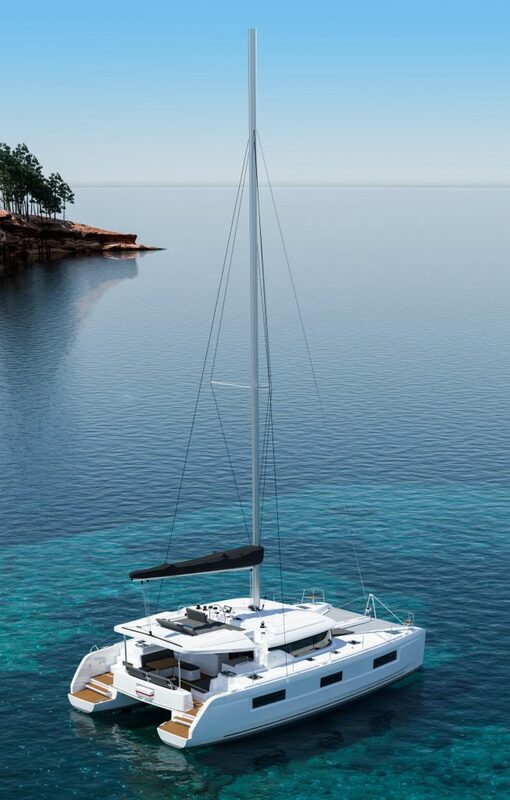 The shorter boom and high aspect mainsail, with a traveler adjusted using an electric captive winch, makes for easier sail handling and maneuvering as well as optimized performance. 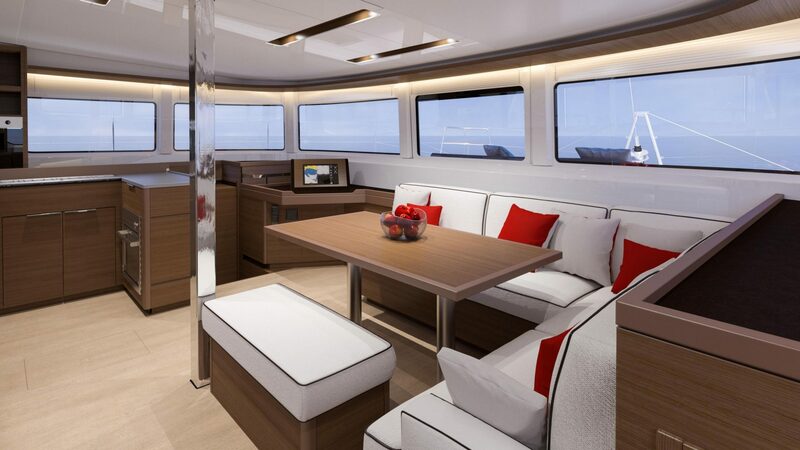 All the navigation tools and sail controls are neatly organized and in easy reach at the Fly-bridge. 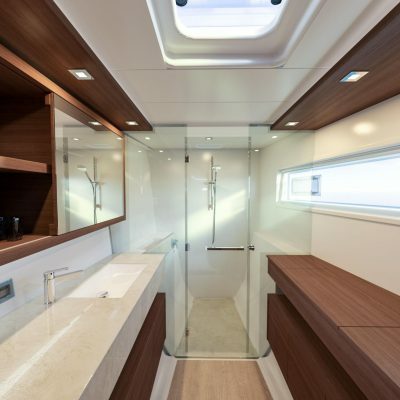 The narrower hulls below the waterline create less drag, but with the chine there is no compromise to interior space, so better performance and better accommodation! 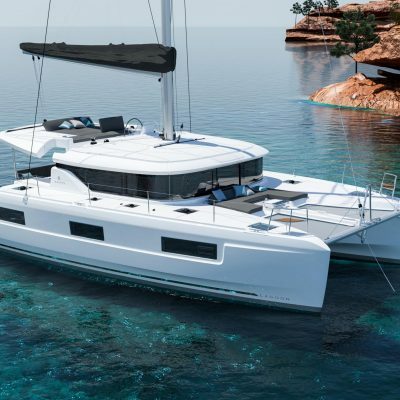 With electric winches where needed, autopilot and the latest B&G navigation equipment sailing this boat can be sailed comfortably short-handed. 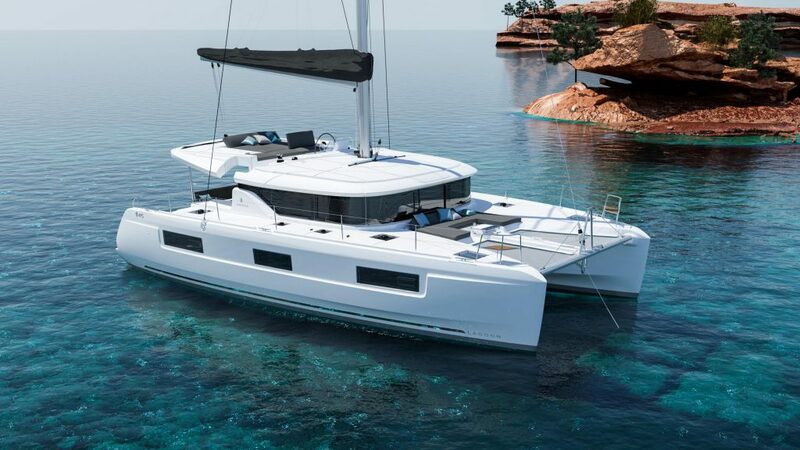 With cable steering, the helm feedback is excellent. Under power she is smooth and responsive. The Yanmar 45 HP diesels are standard but there is an upgrade available to 57HP that we recommend. 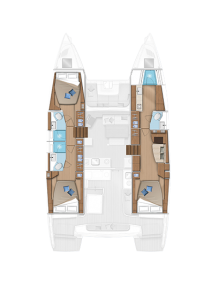 On the Lagoon 46 there is a choice of dinghy davit, the standard system operated with a captive electric winch, or you could select the tender-lift option and have it double as a bathing platform when the dinghy is launched. 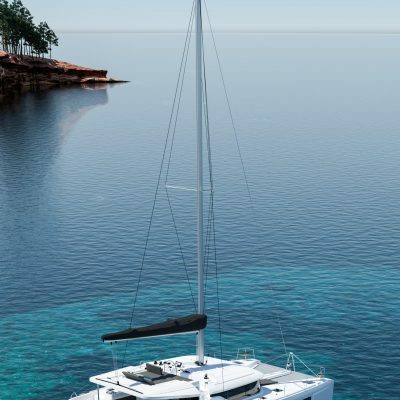 The transom steps are wide, giving easy and safe transfer to and from the dinghy, and the two steps up to the cockpit are shallow. The side decking is wide with flush hatches and plenty of handholds when moving forward or aft. Access up to the fly-bridge is from either side of the boat from the side deck, and from the cockpit port side, with wide safe steps. Up forward the transition from trampoline to the forward cockpit is flush, no stepping down and the cowling for the anchor windlass makes a great table top. 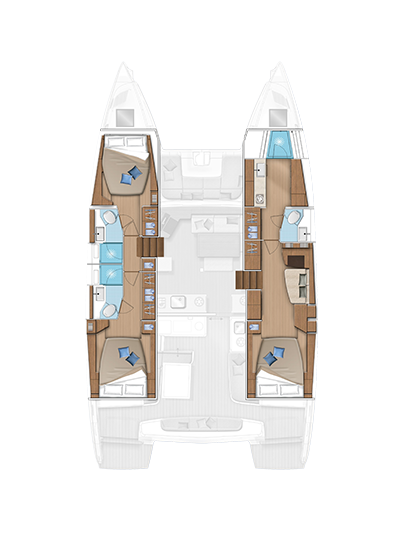 All the heritage, tradition and quality of Lagoon have been encapsulated in the Lagoon 46, and with advanced design performance and superior comfort this is going to be a stunningly successful boat.